Rye is one of the best-preserved walled medieval hill towns in England. It also has a wonderful selection of Tudor and Georgian buildings. The town kept a strong sense of its own identity when many high streets became clones of one another. 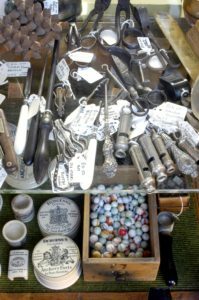 One of its great draws is its many independent shops, particularly its antiques outlets. Aside from a spattering of high profile brand names there are no signs of the clones that dominate high streets. Its quirky and fiercely independent character attracts artists creatives, and its artistic output still flourishes. Rye is a senior member of the Cinque Ports Confederation. This started in Saxon times for mutual protection and trade purposes, in the Saxon times. It was an important supplier of ships to the Crown. And it was a vital defence during the Hundred Years War with France in the 13th and 14th centuries. It remained so until the formation of a professional navy – forerunner of the modern Royal Navy – in the 16th century. 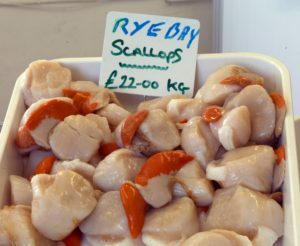 Today, Rye is still a small port with a thriving fishing fleet. The post of Lord Warden of the Cinque Ports – previously held by H M Queen Elizabeth the Queen Mother, Sir Winston Churchill and the Duke of Wellington – remains. For a small town, Rye is well served by its train links from Ashford International in Kent and along the south coast from Brighton and Eastbourne. 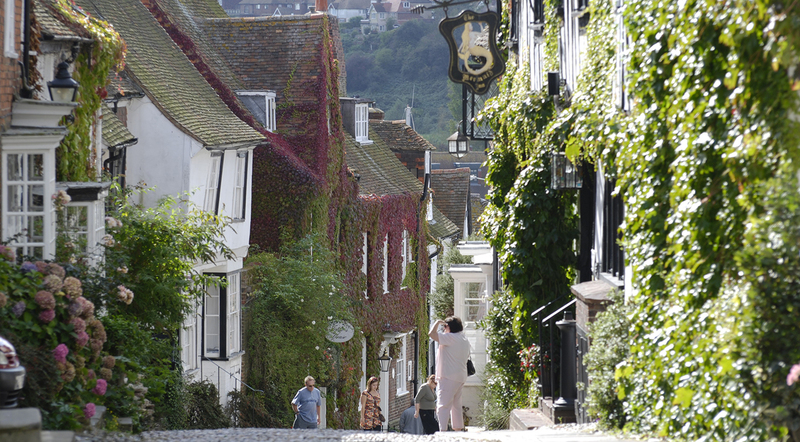 Though the town’s hill-top location leads to some steep climbs, Rye’s size makes it best explored on foot. It is compact enough to discover at your group’s own leisure. Although there are good opportunities for your members to learn about the town with a guide should you wish. Once you are in Rye, a good starting point is the Rye Heritage Centre on Strand Quay, a short walk south from the railway station. Open daily, there is a sound and light show centred around a model of the town. Built by two local residents over four years, it takes you through 700 years of local history. Audio handsets can be hired to use as you walk around Rye, providing insight into the town’s architecture or its ghostly past. There is also a lovely display of old, fully restored ‘end-of-the-pier’ machines, which are in working order. Just past the Heritage Centre is Mermaid Street, perhaps the most famous of the town’s cobbled streets. Its Mermaid Inn was a notorious haunt of smugglers during the 18th century. When their activity was at its peak the feared Hawkhurst Gang sat and drank with loaded pistols on the table! The current building dates from the 15th century when much of the town was rebuilt after a raid by the French in 1377. The inn is now a high quality restaurant and hotel, and is perhaps an option for smaller groups visiting the town. You may even spot film stars such as Johnny Depp in the bar, visiting one of his favourite UK areas! Mermaid Street is also where you will find the 15th century Hartshorn House and 16th century Jeake’s House. The former was the family home of 17th century diarist Samuel Jeake II. It was a hospital during the Napoleonic wars. Although it is now a private house again, locals know it as ‘The Old Hospital’. And it is worth stopping at if only to admire its brick and timbered front and distinctive three gables. Although known as Jeake’s House, it was actually Jeake’s wool store and is now a pretty bed and breakfast. At the top of Mermaid Street is the 18th century Lamb House – now cared for by The National Trust. It has previously been home to some of Rye’s most famous literary residents. The American-born writer Henry James made it his home from 1898 until he died in 1916. James welcomed many visitors here including Edith Wharton. The prolific novelist and Mayor of Rye in the 1930s, E.F. Benson, lived at the house after James, until 1940. He created the Mapp and Lucia social comedies, set in the fictional town of Tilling, based on Rye. Rumer Godden was resident in the late 60s and early 70s; one of her most famous novels is ‘Black Narcissus’, which was a film starring Deborah Kerr in 1947. Please note the house is one of the Trust’s smaller properties, so visiting groups are split into parties of 15. A limited number of group visits are also available outside normal opening hours. Make your way up West Street and turn left into Church Square, and you will find the very large 12th century St Mary’s Church. It is at the centre of a series of beautifull medieval buildings. These include Fletcher’s House, some believe it is the birth place of the 15th century Jacobean playwright John Fletcher. It is now a tearoom. Climbing the tower of St Mary’s affords some wonderful views of the surrounding countryside and you can also see the original ‘Quarter Boys’, which stood above the clock face and used to strike each quarter hour. Hear how French raiders stole the church bells in 1377! If you follow Church Square around past Ypres Tower, this leads to Market Street – the former Market Place. Turning right brings you to East Street, where you will find the main site of Rye Castle Museum. Here there are exhibitions on Rye’s history and items from its past. These include its 18th century fire engine and displays dedicated to fishing, shipbuilding, Captain Pugwash and Rye Pottery. Turning left at the end of East Street brings you onto the idyllic High Street with its eclectic mix of shops. It’s a good place to stop and browse for an hour or two. It is home to Grammar School Records, a delightful independent music outlet, as well as art galleries and antique outlets. If you follow High Street downhill, this brings you to the 14th century Landgate, through the town wall. In times past, when Rye was surrounded by the sea, this gate led to the one land access to the town. If you are looking to stretch your legs, there are some wonderful walks from the town into Rye Harbour Nature Reserve. Henry VIII’s Camber Castle within its boundaries, provides a physical timeline of the different coastal defences. For very keen walkers, the 28-mile Royal Military Canal Path begins near Folkestone and passes through Hythe and Rye to Cliff End near Hastings. The walk has many opportunities to spot flora and fauna along the way.